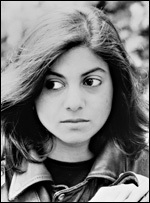 Born in Calcutta in 1960, Rita Wolf (real name Rita Ghose) came to London at an early age and trained at the Royal Court Youth Theatre . Her first leading role was in the film Majdhar (d. Ahmed Alauddin Jamal, 1984). She worked in a number of UK film productions including My Beautiful Laundrette (d. Stephen Frears, 1985) and Slipstream (d. Steven Lisberger, 1989) as well as appearing in television comedy series Tandoori Nights (Channel 4, 1987). In 1990 Wolf co-founded the Kali Theatre Company with Rukhsana Ahmad , to produce the work of Asian women writers and to tell British Asian stories.